Mordanting is the process of making fabric colour fast by impregnating it with a compound – usually a salt – that will also readily attach itself to the dye as well. Many compounds will function as mordants. Buy and thoroughly read a good book on home dyeing. Heed what they write about mordants and mordanting. Two of these include: The Handbook of Natural Plant Dyes, by Sasha Duerr, and, Natural Dyes and Home Dyeing, by Rita Adrosko. Aluminum sulfate, Al2(SO4)3, is a salt, a type of alum, that is commonly used for mordanting and is readily available. Its MSDS lists its primary risk as an irritant. Sodium sulfate, Na2SO4, is a salt that was originally called Glauber’s salt. It was used as a laxative in the 1700’s. It is mostly used as a bulking agent in detergents today. A very pure form of it is mined in Saskatchewan where it occurs on the surface at Chaplin Lake which is a Western Hemisphere Shorebird Reserve Network. Its MSDS lists its primary risk as an irritant. Caution must always be used when handling mordants. Protective clothing is a must. Heating must be done outdoors where there is plenty of ventilation. Do not breathe the vapours coming off the dye pot. For every 4 oz. of fibre use 1 1/2 tsp. mordant and 1 1/2 tsp. cream of tartar. Prior to mordanting soak the wool in water for at least 1 hour. Add boiling water to the mordant and cream of tartar, dissolving these completely. 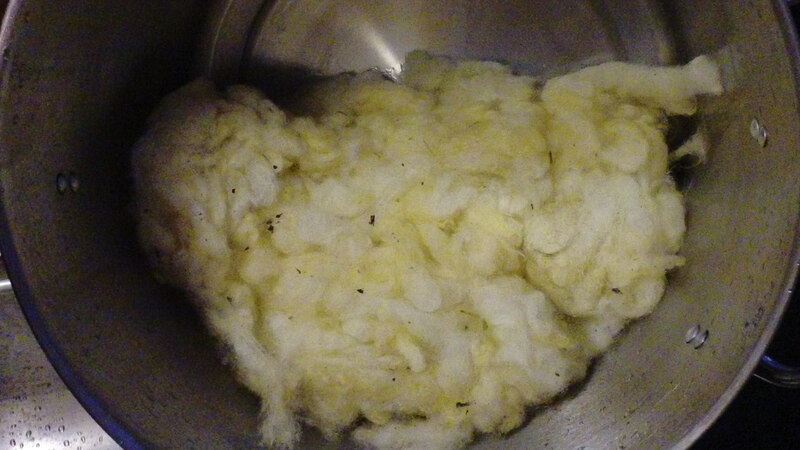 Add this to a clean dye pot containing enough water to cover your hank of fibre and stir. Add the soaked fibre. Place the dye pot on a burner and simmer for a minimum of 1 hour. Turn off the burner and allow to cool. Remove the fibre and wash with pH neutral soap, then rinse. This will remove any unfixed mordant. The rest of the water solution can be poured down the drain or put around acid-loving plants in your garden.